This afternoon, I was stressed out. I appointed a consultant to work on some tasks over the weekend. However he waited till the last minute and crammed today on deadline day. So after trying to manage some damage control, I decided to take a break to relieve me of the stressful situation.... so I visited my favorite Timezone branch. 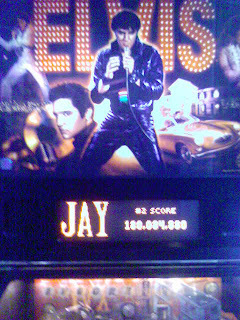 My favorite game is the Elvis Presley Pinball machine. I usually play this game three times a week. However today, the machine was missing from its regular spot. I thought they just moved it to another location since they rearrange game machines from time to time. When I couldn't find it, I asked the manager where it went. He told me that some Elvis aficionados rented the machine for one month for personal unlimited use. Huwwwwat !?!?!?! My stress reliever is gone ! And so I'm going to have to settle for Tekken or visit another Timezone branch. To those who rented the machine, feel free to beat my score. I have the top 2nd and 3rd score with 180 million as my highest score. Practice well and you can challenge me anytime afterwards. Unfortunately, your high score might be lost since they unplugged the game. . . . True. I'm hoping there's an onboard chip where top scores are saved even when shutoff and unplugged (and they don't reset the scores). At least you were able to take a picture of your highest score. Matatagalan talaga sila if they wanna beat your score.